“Today we’re incredibly excited to announce the launch of our first antenna optimization product: the SDA 2000 OptimizIR. This replaces your existing controller and provides a new way to interact with your SteppIR antenna. 180-Degree Mode. The 180-degree mode allows users to electrically “rotate” the antenna 180 degrees opposite the forward direction beam heading. Bi-Directional Mode. The bi-directional mode function operates in a similar manner to the 180-degree mode, except when enabled the antenna operates as a hybrid Yagi with forward gain occurring in opposite directions, simultaneously. Element Retract Mode. With the Element Retract Mode, the user can retract all the elements on a SteppIR antenna to the home position, and the controller will then power down automatically. Transceiver Interface. This enables the automatic adjustment of each element of the antenna as the radio tunes. Tuning Relay. The lock-out relay connects via a PTT cable to the RF power source and prevents the amplifier from transmitting while the SteppIR antenna is being tuned. Advanced Lightning Protection. Each driver chip inside the OptimizIR has a relay in front of it that protects against lightning, nearby lightning incidents and dead shorts. Not only is this the first product we have released since being acquired by Intentional Systems, but this is the first of many we hope to release over the next year. We have a lot of ideas and hope to get many more directly from you: our customers and our community! To make sure you have the latest and greatest SteppIR news, sign up for our newsletter. So go ahead and take and look. 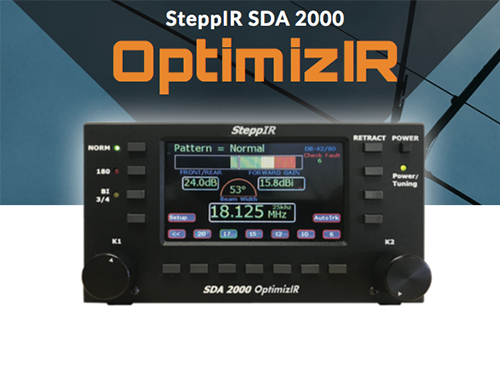 And if you like what you see, pre-order your SteppIR SDA 2000 OptimizIR today! SEATTLE and SAN RAMON, Calif., Oct. 20, 2017 (GLOBE NEWSWIRE) — SteppIR Communication Systems, a global provider of communication products and services, today announced at PACIFICON 2017 the release of the new SDA 2000 OptimizIR antenna optimizer. With the ability to optimize antennas for maximum gain, maximum front-to-rear, or a combination of both, customers will experience a new way of interacting with their SteppIR antenna. The company is accepting pre-orders today on their website at www.steppir.com and will be delivering product in the first quarter of 2018. Additionally, the company announced that it has been acquired by Intentional Systems Inc., a company founded and led by John Mertel, who also co-founded SteppIR in 2001 with Mike Mertel and Jim Thomas. Intentional Systems is focused on building a broad array of product and service capabilities in the global communications market through both organic expansion and strategic acquisitions. SteppIR represents a foundational piece of the Intentional Systems framework and will continue to be invested in and expanded to meet market and industry needs. Mike Mertel will remain associated with the company in an advisory capacity and Jim Thomas will remain with the company as Vice President, Product Engineering.